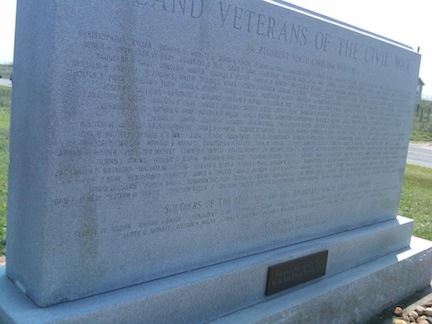 While most of the sesquicentennial spotlight this year has focused on Ft. Sumter and First Manassas, the North Carolina coast has also been commemorating events. 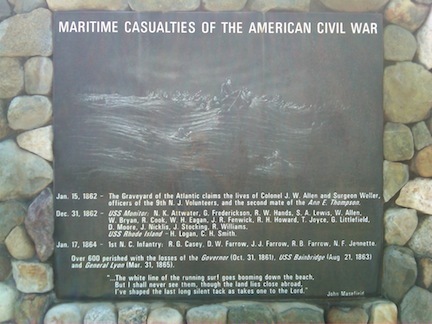 After all, the fall of the Outer Banks—beginning with the Confederate surrender at Hatteras Inlet in late August of 1861—represented the first major Union success of the war. 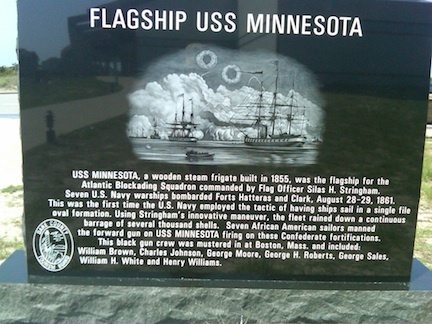 It also represented the first success for the Anaconda Plan—the North’s attempt to strangle the Confederacy by cutting off its shipping capacity. While the Outer Banks proved to be an important theater of operations during the early war, events there have largely been forgotten—until now. 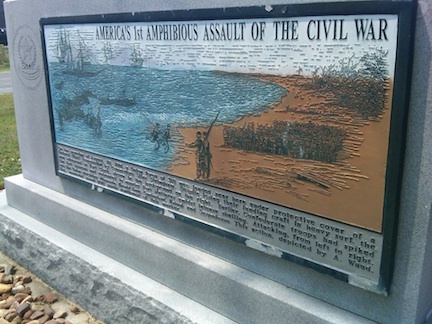 In May of 2011, the North Carolina Civil War Trails system added several locations along the Outer Banks, covering events from the first amphibious landing of the war through the establishment of a Freedmen’s colony on Roanoke Island. 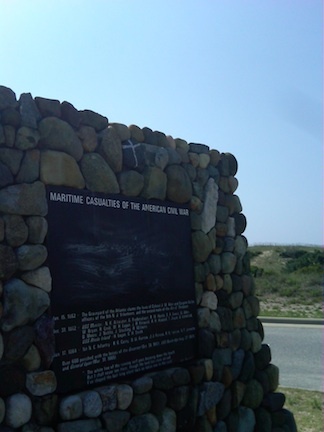 There are fifteen spots in all, including some National Park Service wayside signs, some new monuments, and a memorial to maritime casualties from the war. 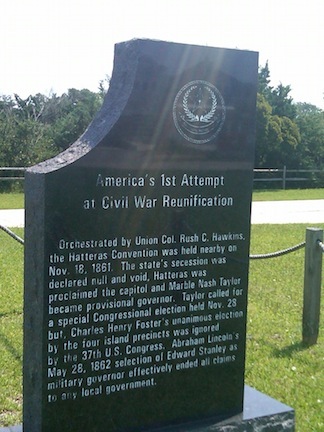 The newest marker, originally slated for dedication at the end of August, was postponed due to Hurricane Irene. 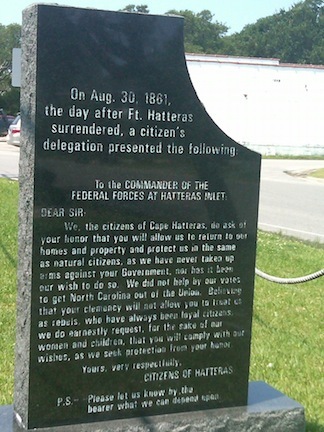 Benjamin Butler, who’d later earn nicknames like “Beast” and “Spoons” for his occupation of New Orleans in May of 1862, led the expeditionary force that captured forts Clark and Hatteras at the southwesternmost tip of Hatteras Island. As the story goes, President Lincoln, awakened in the middle of the night to receive the news, danced a jig in his nightshirt. 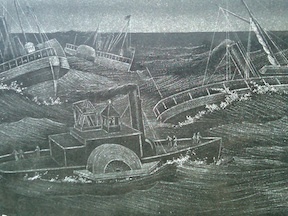 The fall of the forts opened the way for the Union Navy to get into Pamlico Sound and shut down much of the Confederate shipping that moved through the area. Albemarle Sound, farther to the north, still remained in Southern hands, though. 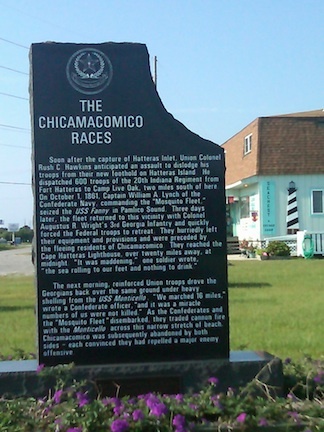 Union forces set their eyes on Roanoke Island, which held the key to the position, first establishing a base in Chicamacomico (modern-day Rodanthe). A back-and-forth see-saw of engagements in October—dubbed the Chicamacomico Races—did little to shift the tide one way or the other. By early 1862, the Union army was ready to launch its takeover of the island. Ambrose Burnside, best known as the Union commander who led the army to disaster at the Battle of Fredericksburg in December of 1862, had his best days of his career leading the attack, which finally came on February 7. The Union victory opened the door to an attack on New Bern—the state’s second-largest city—which came on March 14. 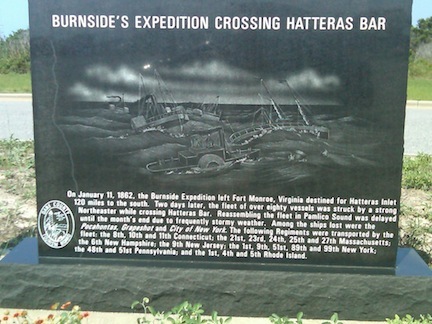 Burnside’s victories essentially closed down all but a tiny fraction of the North Carolina coast. 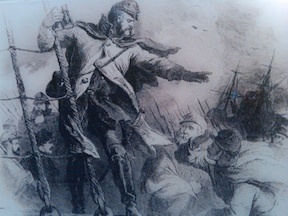 His success also earned him a reputation as an innovator and a promotion to major general—a promotion that eventually put him in charge of the Army of the Potomac. 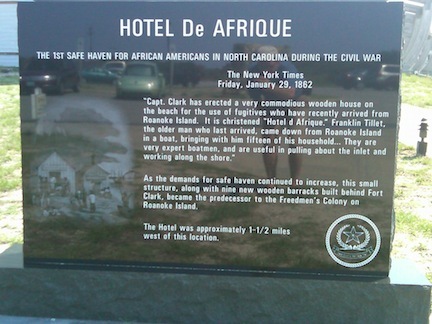 As 1862 turned into 1863, Roanoke Island became a haven for former slaves who’d sought protection from the Union army. The Federal government eventually established a Freedmen’s Colony on the island’s northwest coastline. 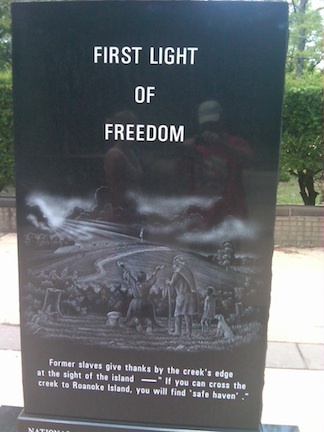 According to the NPS, some 3,500 Freedmen made their home there by 1865. 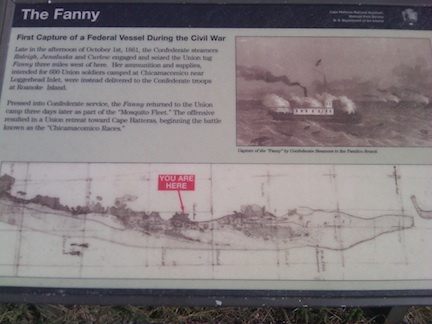 Dare County’s Civil War Trail captures sites related to these and other events: the capture of the U.S. steamer Fanny; the sinker of the U.S. troop transport Oriental; the loss of the U.S.S. Monitor; “Hotel De Afrique,”the first safe haven for freed slaves in N.C.; and the first citizens’ petition for reconciliation with the Federal government, among others. 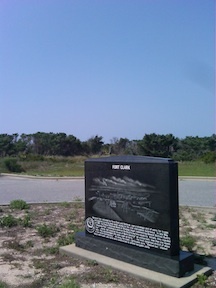 One “must” stop on the trail includes the beautiful Graveyard of the Atlantic Museum near the Ocracoke Ferry terminal. 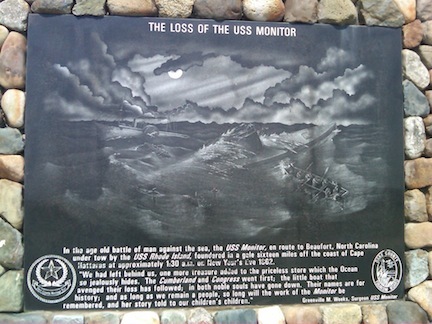 The museum features an exhibit on the Monitor and the lost Union submarine Alligator—one of the lost legends of the entire war. It helps, too, that the Outer Banks remains one of America’s most stunning landscapes. Aficionados don’t tend to think of the Civil War when they think of the Outer Banks, and Federal victories along the North Carolina coast now seem of little consequence when compared to those larger events at Ft. Sumter and on the hills outside of Manassas. At the time, though, they could not have been more important. 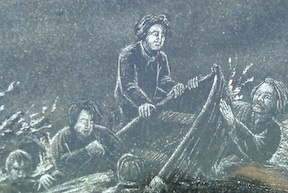 They provided a huge morale boost to Northern spirits at a time when there wasn’t much else to crow about. 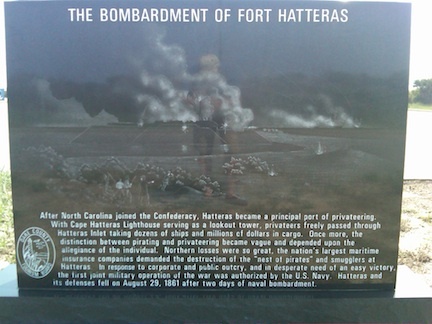 This entry was posted in Battlefields & Historic Places, Battles, National Park Service and tagged Ambrose Burnside, Battle of Roanoke Island, Benjamin Butler, Chicamacomico Races, Fredericksburg, Freedmen's Colony, North Carolina, OBX, Outer Banks. Bookmark the permalink. Nice coverage of early war period on the Banks. The North Carolina State Archives is highlighting some documents concerning state efforts during this period. See the First Wednesdays project at their blog. 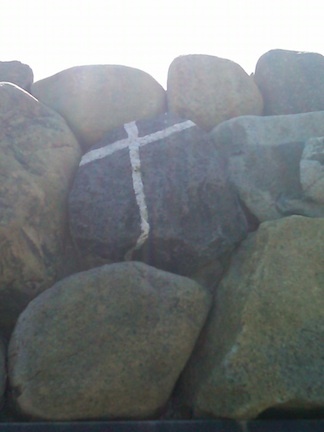 The markers are evidence that locally at least we have not forgotten this period of the war. From your post it seems that you must at least be familiar with Richard Sauers “A Sucession of Honorable Victories.” Craig Symonds also covers some of the same ground in his review of naval combat during the war. Keep up the postings – we will be reading! Thanks, Chris. My trip to the OBX in August was my first time down there in about five years. Prior to that, I used to visit a couple times a summer. I always thought the Civil War history down there was something that could be highlighted a bit more, so I was really heartened by all the attention it seemed to get during that five-year gap. Here at Emerging Civil War, we hope to give it more attention in the weeks and months ahead. I am a new subscriber and find this site very interesting. I am President of the Phil Kearny CWRT in NJ and will recommend it to my membership. Keep the articles coming. Great work. Thanks, Joe. We appreciate the support. Hopefully we’ll be able to keep bringing you a wide array of interesting things to think about. We are glad to hear you are enjoying. All of us are having a great time with the site. Thanks for stopping by and supporting our effort. We keep expanding. Our reading lists are growing as well as our research area. So please stop back often. My wife graduated from East Carteret H.S., and spent many years in the New Bern, Harkers Island, Beaufort, Morehead City area. The North Carolina theater saw many early battles and also the final battles of the war, yet is largely overlooked in the public awareness. Thank you for a nice attempt to rectify that. I spent a lot of time this summer looking at those early and late battles, Tim, but to be honest, it was more by happenstance than design. Only once I wrapped up my summer in the south did I start to notice the pattern of things. I’m glad I got to explore so much of the state, though!